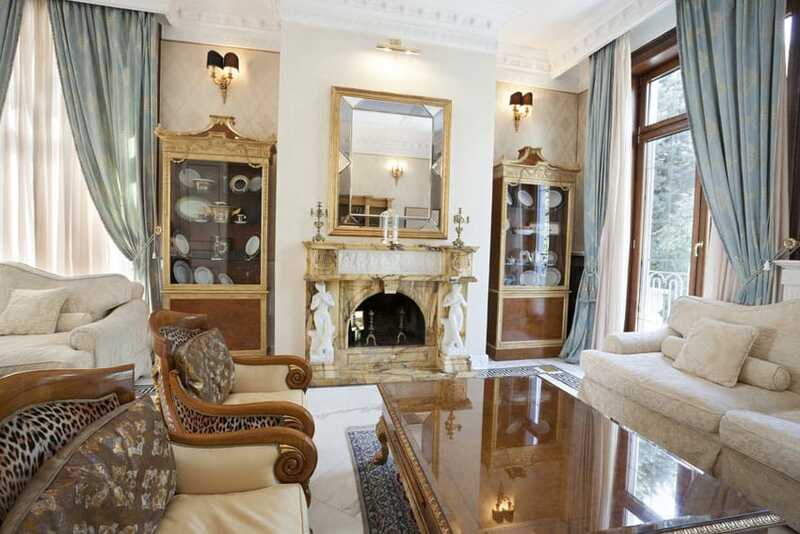 Welcome to our beautiful gallery of formal living room design ideas. These luxuriously decorated living room designs were created by top interior designers and showcase a variety of colors, textures, patterns and types of furniture. 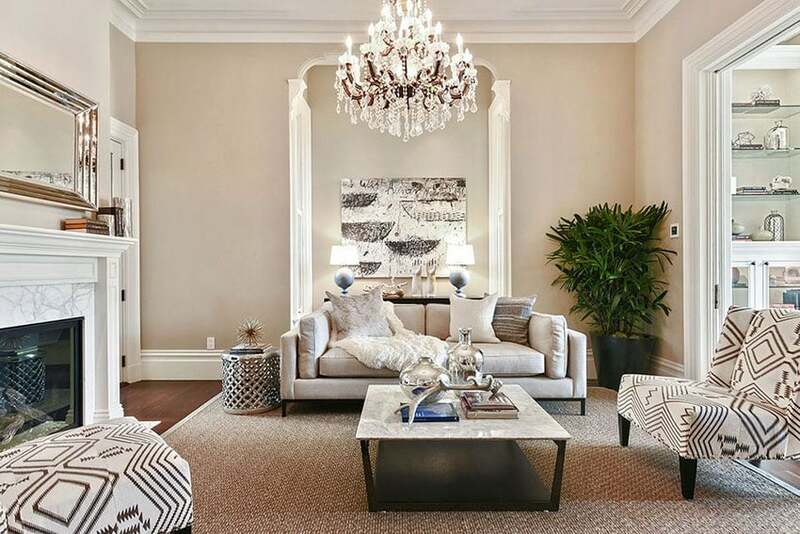 Below you’ll find gorgeous rooms with a variety of high-end furniture pieces, and an interesting mix of styles and decor to help you find your ultimate formal living space. Accent colors go well with the elegant gray-white palettes of many formal living rooms. In the example above, a generous helping of navy blue is applied on the arm chairs and playfully-patterned throw cushions; this complements the gray paint of the walls and the white of the crown moldings and tray ceiling. The navy theme is further carried out by the knotted white rug and dark oak wood flooring. 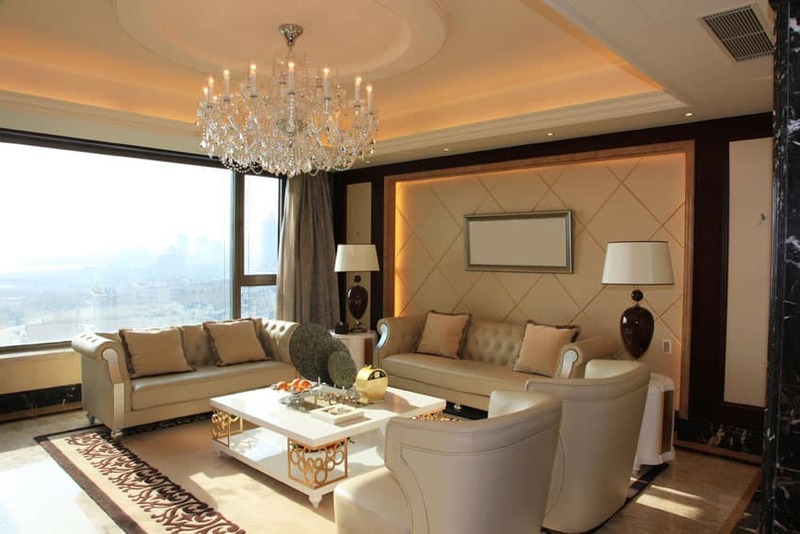 The white leather English sofas and glass chandelier give the room an extra touch of class. An integral part of any household is the living room where everyone gathers to spend time together and for conversation. However, have you ever considered the effectiveness of the design that would impact the mood and patterns of those who use the room? The setting of the interior space bears a major impact upon our behavior by the elements that it addresses. For an instance, the color palette, furniture and living room layout are a few of the important features that needs to be analyzed. 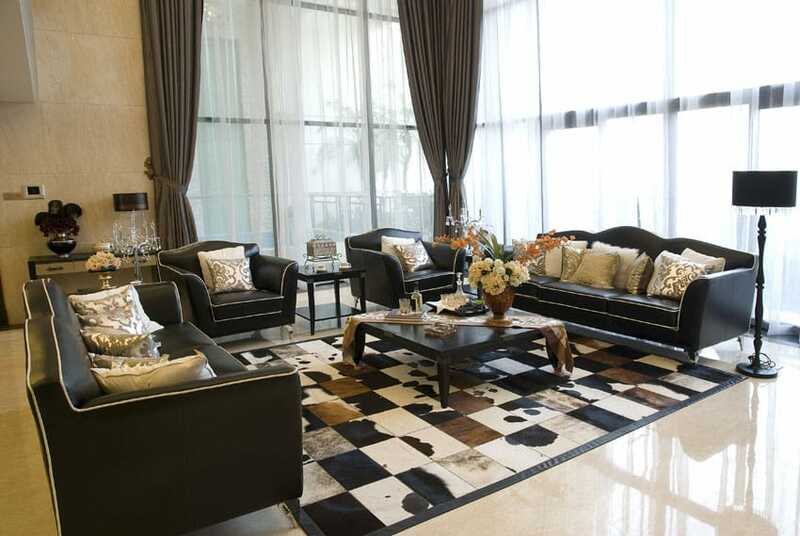 The main key is to understand the living room space excluding its furniture. Once that is done, you may be able to come up with innovative configurations for an optimum living room layout. Analyzing the essential traffic patterns such as the main entrance door to the optional exit door can come in handy to understand where to install additional furniture pieces without obstructing circulation patterns. Listing out the functions wanted and the quantity of users of the space are a great option to further enhance the design. The lighting, material consideration and the layout should be designed accordingly, giving the prominence to the activity that happens regularly. Most commonly in a casual living room a fireplace and a TV compete against each other to be the main focus of the living room. You have the choice to select what you want others to see at their first glance when they walk into the room right away. The focal point/s should be given prominence by arranging the other furniture around it or by making it stand out more than the other objects. Usually, there are average rules that are adhered to by people to create more orderly spaces. For instance, furniture pieces are supposed to be placed in a parallel line to create a more organized view whereas angled furniture may create a bit of a cluttered view point depending on how it is positioned. If the furniture pieces are large, the interior layout should be designed accordingly. For an example the sofa could be faced directly towards the fireplace or placed perpendicular. If you have problems with two main focal points, you should choose the focal point that bears a lot visual weight and merge into the secondary focal point. For an example, at the same time the sofa faces the fireplace, it can be placed perpendicular to the secondary focal point. That way, the idea of merging the whole interior space is a dream come true. By analyzing the functions and needs of each person you have the ability to customize your formal living room to fit your family. When not in use as a formla dining room the space can even be transformed in to a cozy corner, and with the addition of two seater couch, or it could be easily transformed into a play area with a little thought. Glass chandeliers and fireplaces have two things in common in this formal living room setup – they function as good light sources and they serve as accent elements in making the room feel elegant and classy. 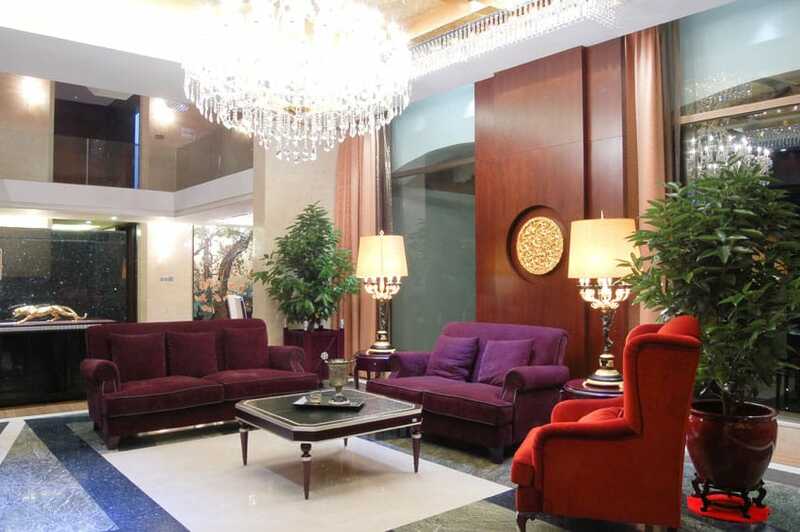 Reflective surfaces such as the polished chrome decors and the wall mirrors only add to that feeling of brightness. The black geometric patterns on the white armless lounge chairs, the gray modern sofa, and the knotted rug define the main living space. The stonetop coffee table in the middle of it all goes well with the stone surface of the fireplace. The white crown moldings, tan-painted walls, and the dark-stained cherry flooring are intelligent design choices for this type of space. High ceiling, glass chandeliers, traditional wood-lined Victorian seating elements – this luxury formal living room is the epitome of class. The round top full-length windows and doors let in much appreciated light into the space. 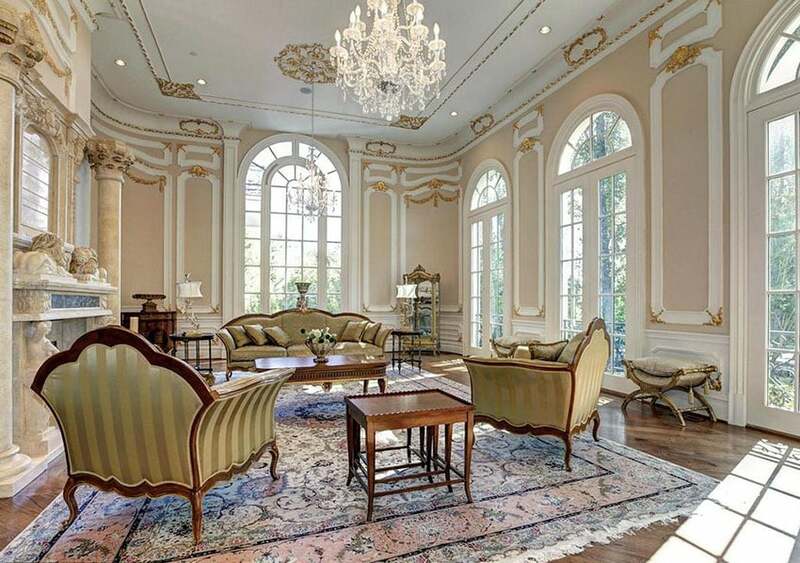 Crown moldings and wall panels, gold gilding on the wall and ceiling elements, and various carvings and Neo-Classical elements on the columns and walls around the fireplace, and the classical Persian rug on the wood flooring top off this thoughtful piece of formal and traditional design with sophistication and elegance. Contemporary pieces and design sense adorn this formal living room. The minimalist marble-surface gas fireplace, the unique contemporary glass chandelier, the brown tufted leather ottoman, the white leather winged lounge chairs and the mid-century modern and Divan style sofas – the furnishings of this room give it an elegant, modern feel. The warm white rug on granite flooring goes well with the white crown moldings on the walls. This eclectic piece of design is adventurous with its color palette and choice of design styles. Different shades of red, maroon, and purple adorn the upholstery of the sofas and armchair. Grays and brown are found on the marble flooring and wooden walls and curtains. 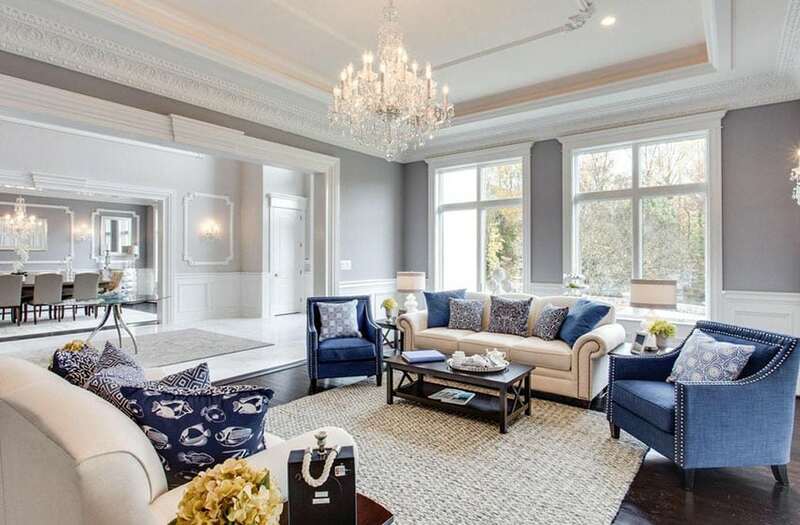 Contemporary also mixes with traditional design styles as seen in the minimalist designs of the windows, balcony glass railings, and the stylistic elements of the walls that all blend surprisingly well with the traditional glass chandelier, English style seats, and polished stone flooring. The elegant ambiance that is brought out by leather furniture is further accentuated in this formal living room by the traditional carved sidings on the Victorian sofa and the wooden coffee table. The low-hung chandelier makes the space feel personal and private but does not diminish the spacious sophistication of the room. The simple striped wallpaper as well as the accent wooden wall panels are also a nice touch. The travertine floor adds a nice final bit of warmth to the space. This drawing room invites sunlight in with its large, full-length windows and light-reflecting polished granite floors. The travertine wall tiles also add to this brightness. The use of white sheer curtains lets light in but also give the living space its privacy. The use of black leather cabriole sofas and arm chairs with white linings, as well as the use of a solid wood black coffee table, add a touch of minimalist sophistication to the area. Finally, the use of a checkered animal print rug and the floral gold patterned throw cushions add some personality to the space. A cozy, welcoming feel is often achieved by rooms that employ the generous use of brown in its decors. In this example, the brown leather armchairs that surround a darker brown leather ottoman show just how intimate the use of brown can be. The cozy wood-burning fireplace, the use of rustic wooden cabinetry and shelves, not to mention the subtle cold and white patterned rug all do its part in making this place truly feel like home. The generous use of windows and view doors give the place a spacious feel, despite its small floor space. The high ceiling of this area give extra wall space that can be played around with. But instead of adorning itself with ornaments, the design keeps its walls plain and clean. This design decisions makes it so that the other elements in the space are accented even more. 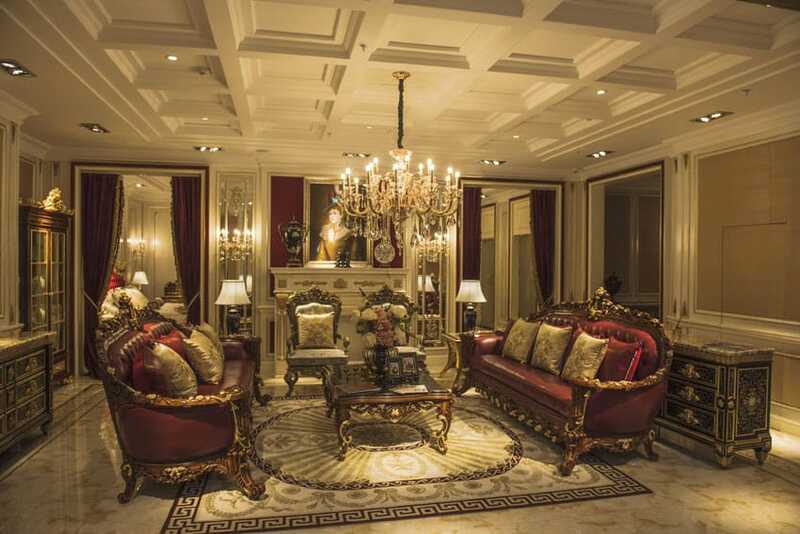 This brings out the elegance of the furniture – the white English sofas and the pink winged leather arm chairs, the large ornately patterned Persian rug, the the floral tapestry hung on the wall, and the sophistication of the grand piano. The mahogany wood flooring, the high windows and glass view doors, and the glass chandelier make the space feel open and bright. This contemporary living room takes advantage of the wonderful landscape design outdoors to further enhance the interior design. A large retractable sliding door opens to give the feel of outdoor living while inside the home. The blue tinges of the outside are welcome partners to the white and browns of the decors and furnishings. The mahogany floor boards, the white mid-century modern sofas, ottomans, and lounge chairs, as well as the white painted walls and ceilings, are all enhanced by the large door openings that bring much of the charm of the outdoors into the coziness of the indoors. The abstract piece of art displayed on the white console side table is also a nice touch of creativity in this example of interior design. This design, with its subtle Asian inspiration and bright red splashes of color, is bold and visually striking. It takes eccentric furniture pieces such as the antique wooden arm chair, the large solid wood Asian-patterned coffee table, and velvet red contemporary sofa and ottoman and puts them together to create an aesthetic eye-catching piece of interior design. 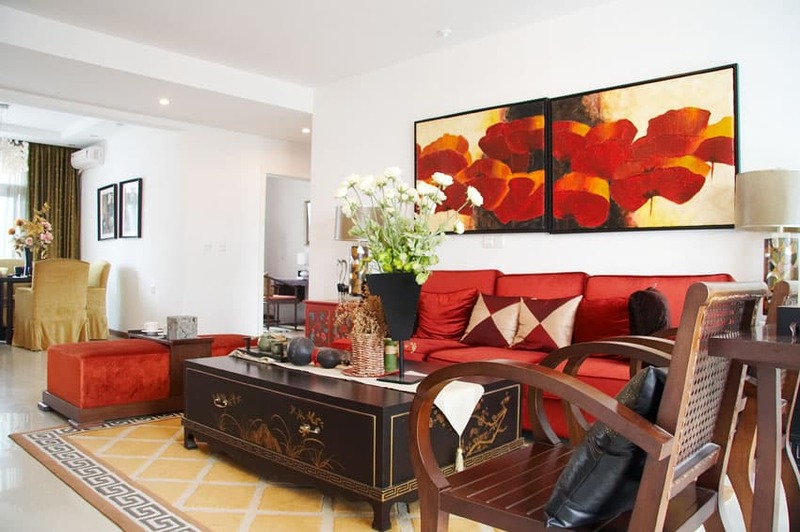 The floral motif used in the form of the table top flower-filled vases and the strikingly scarlet hung paintings also add a bold splash of personality to the space. The Victorian furniture in this example are amazing design pieces. 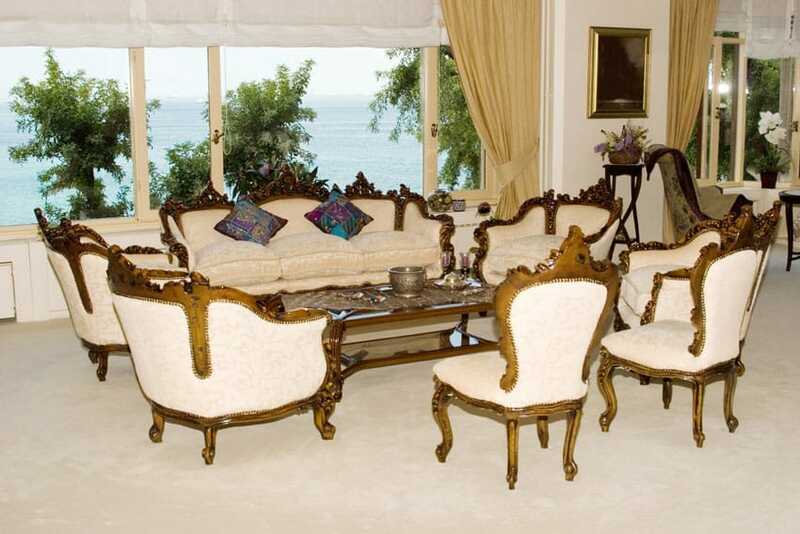 The white microfiber upholstery, the ornate wood carvings for the sides and the chair legs, all enhanced by the choice selection of tan carpeted floor and the use of golden curtains for the windows – all this merge together to create, by themselves, a great example of formal living room design. However, the best part of this piece has to be the ocean views outside. In seaside locations such as this, the use of large sliding windows are common: they give you amazing vistas of the sea as well as letting sea breezes into the area to help with passively cooling the space. This piece of luxury design combines the ornate carvings of Victorian-era decor with contemporary design sense and arrangements. 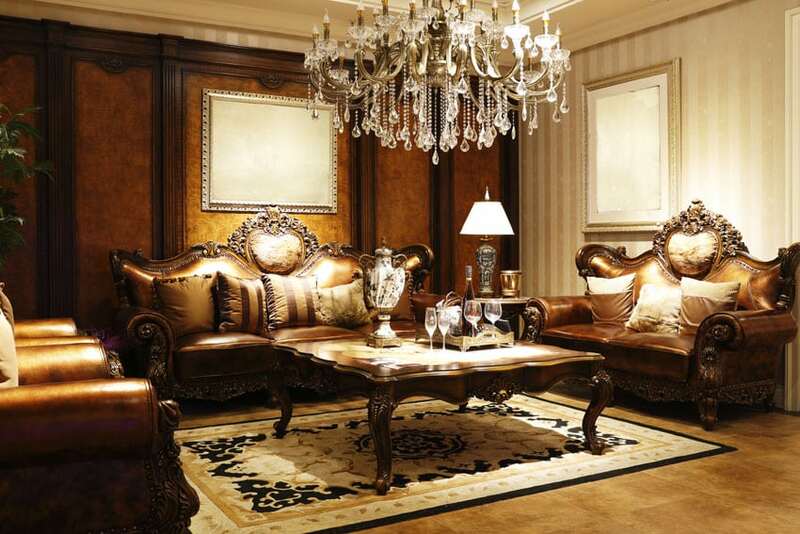 The antique furniture pieces – the sofa chairs with tufted red leather upholstery and rich mahogany wood side trimmings along with the gold floral throw cushions, the similarly Victorian armchairs, and the glass-top carved wood coffee table -are illuminated and accented by the low-hung classic glass chandelier. The marble stone floors, the crown molded ceiling panels and the velvet red door curtain, all add to the eye-catching stylish ambiance of this formal living room. This luxury living room uses a striking color palette of dark velvet red, subtle gold, and off white to create a space that is spacious, full of personality, and undeniably sophisticated. The red leather camelback sofa, the gold upholstered English sofa, and the floral patterned winged lounge chair are classy choices for seating furniture. The red and tan carpet, the white and maroon window curtains, and the playful choice of throw cushions bring the color palette even further. Lastly, the use of polished marble flooring, large full-length windows and view doors, and the bronze chandelier keep the space feeling high end and sophisticated. This traditional formal living room does not have as much floor space as the other examples in this list, but it uses its strengths to still maintain a sophisticated and elegant ambiance. 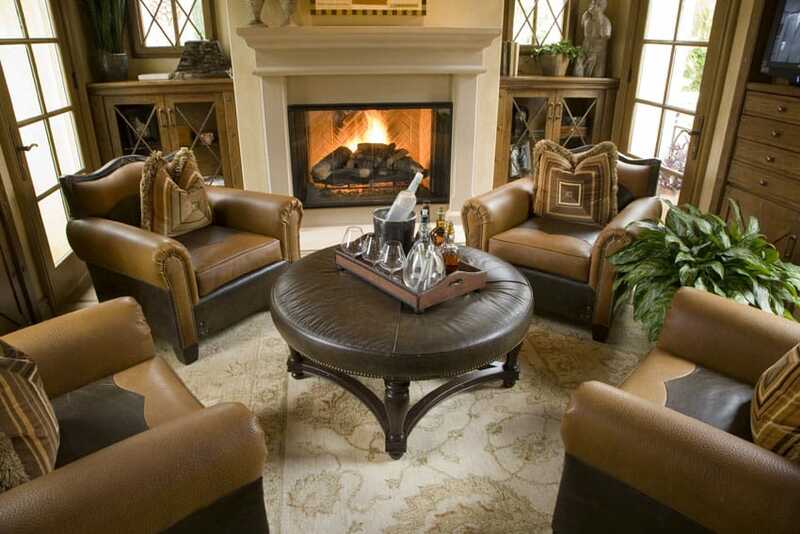 The cozy furniture and room elements – the brown leather lounge chairs, the small circular solid wood coffee table, the white Lawson-style sofa, and the white wood-burning fireplace – play to their strengths and make the room intimate and personal. The knotted carpet on brown cherry wood flooring, the patterned throw cushions, and the various flora that decorate the space, and the tabletop and shelf top decors that are used further give the space life and personality. White-framed single hung windows and glass view doors were used to keep their space feeling spacious and not too cramped by letting light in and giving the users ample views of the outdoors. Some designs create spaces with varied furniture pieces but others also make use of furniture pieces that were designed and manufactures specifically for each other. 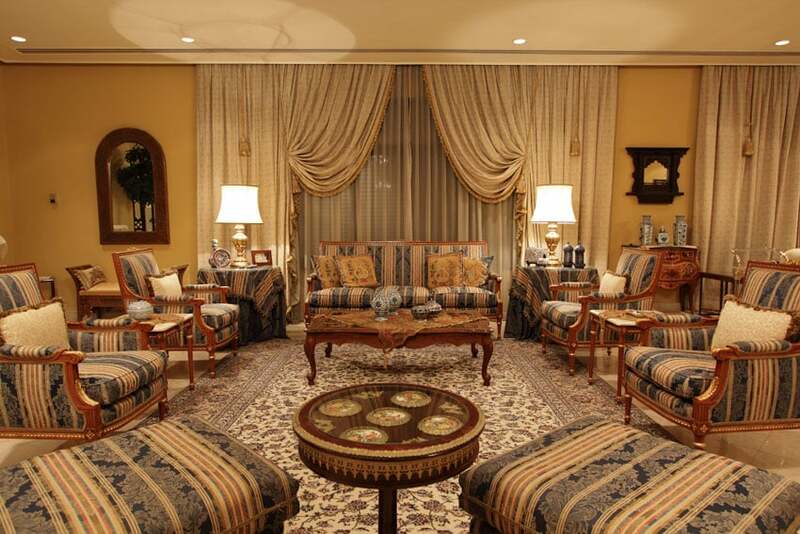 In this living room design, all the seating furniture – the arm chairs, ottomans, and the camel back sofa – have matching blue, white, and slightly red striped floral upholstery patterns. These patterns can also be seen used as tablecloths for the side tables. The matching glass-top wooden coffee table and side table are nice touches to the design. The floral patterned rug on polished granite floor tiles anchors the whole design together, while the gold-trimmed curtains add an additional touch of class to the space. This apartment living room makes full use of its nice skyline views by having a large window that lets copious amounts of sunlight and openness in. This helps showcase the undeniably high end furnishings in the space – the tan tufted leather cabriole sofas, the armless winged lounge chairs, the white and gold stone coffee table, and the varied use of different kinds of black and marble on the floors and walls. The glass chandelier is a nice final sophisticated touch to the room. Many formal living room design ideas are located at the front of the home when one can greet guests in a formal setting. Compact living spaces have as much potential to be stylish and sophisticated as large areas. In this example, the clever use of elegant camelback sofas, an ottoman, and a chaise lounge sofa makes all the difference. 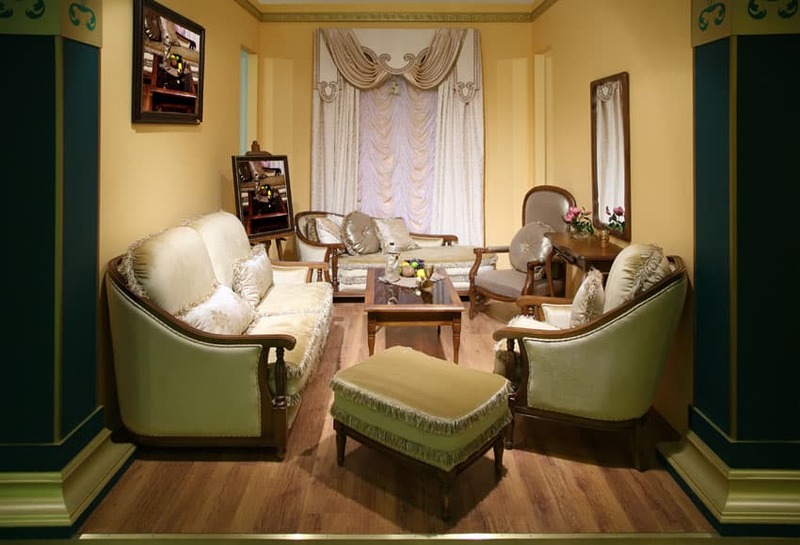 Couple these with the classy use of mahogany floor boards, yellow and blue green accent walls and crown moldings, and the subtle yet undeniable charm of a draping golden window curtain, this design goes to show that some of the best examples of interior design comes in small packages. This contemporary living room design showcases design elements that are commonly used in luxurious and modern formal living rooms. The polished granite floor employs different patterns and colors to break the visual monotony common in large floor areas such as this one. The visual breaks are also seen in the varied treatments of the living room walls – dark gray alternating with accent walls of white. The black leather furniture feature minimal ornamentation or stylistic elements, further giving the room a bold and simple ambiance. It makes one feel as if you are in a Piet Mondrian painting. The subtle saturated use of light blue curtains adds a splash of color in this brown and white formal living room. The use of a glass-top wooden coffee table, leopard skin patterned upholstered arm chairs, and floral patterned English sofas all add a touch of personality to the space. 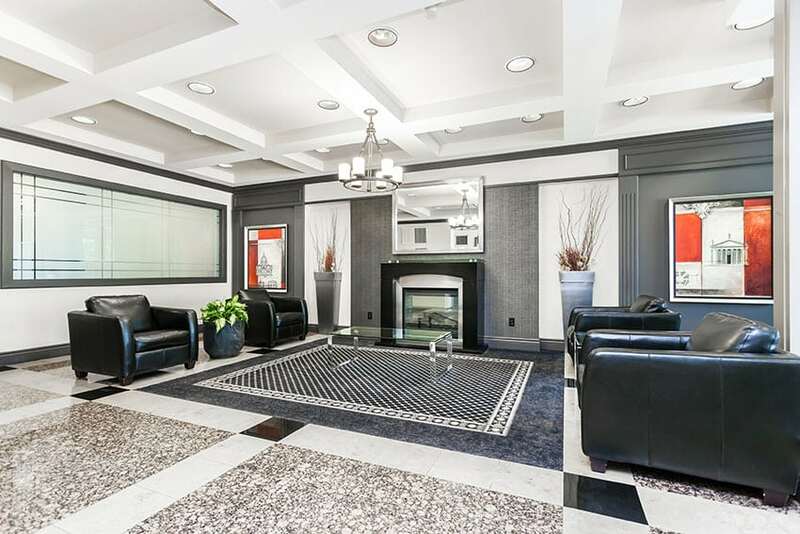 Its use of white and gray marble flooring and the tan and brown marble siding of the wood-burning fireplace make the space feel classy and sophisticated; the Venus mini caryatids are also a nice touch. The generous employment of glass doors and windows as well as the wall mirror keep the room feeling spacious and bright. This living room appears to be situated near the back of the home and features red oak flooring, black and white patterned rug, and cowskin patterned seating elements. The much-appreciated dark decor contrasts to the copious amounts of bright white in the room creating a luxurious ambiance. Certain parts of gray accent walls aside, almost everything else in the room is a beautiful splash of white. 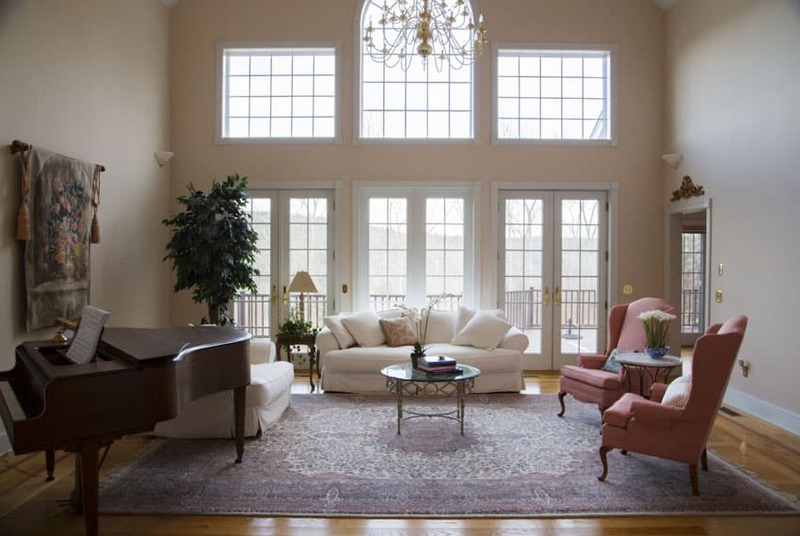 The white leather Lawson-style sofas, the white door and window frames of the large glass windows and view doors, the white crown moldings and wall trimmings – these all add a nice brightness to this wonderful piece of formal living room design. We hope you enjoyed this gallery of formal living room design ideas. Make sure to check out the related picture galleries listed below for more designs.